In the 19th century, Paris underwent profound transformations above and below ground, from the city center to its outskirts. Georges Eugène Haussmann, Prefect of the Seine from 1853 to 1870, embodies this entire century of public works that continue to shape the city’s organization and identity. Paris Haussmann explores and analyzes the characteristics of this homogenous yet polymorphous cityscape, the result of a lengthy process of changes and evolutions, even in recent times. Research was conducted at all levels to classify and compare roadways, identify public spaces, and organize the blocks and buildings according to their current geometry. 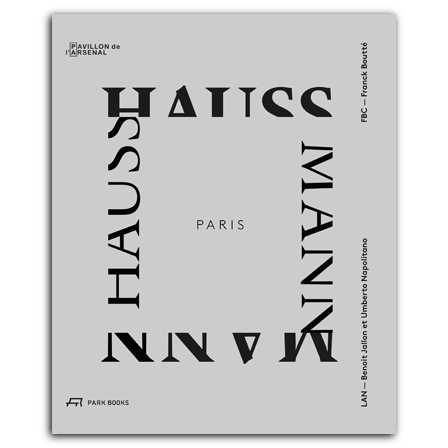 For the first time, the qualities of the Haussmann model have been set forth to show how they grapple with the challenges that contemporary cities face. Rich illustrative material, photographs, various plans and maps, floor plans and sections, axonometric projections, diagrams and other graphics, and statistical analyzes complement topical essays. The book is published in conjunction with an exhibition at the Pavillon de l’Arsenal in Paris in spring 2017.
, born 1968, is an architect and civil engineer and principal of Paris based engineering firm FBC Fanck Boutté Consultants. , born 1972, graduated as an architect in 2001 from Ecole d’Architecture de Paris-La Villette and is a founding partner of LAN (Local Architecture Network) in Paris. , born 1975, studied architecture at Università Federico II in Neapel and at the Ecole d’Architecture de Paris-La Villette. He is a founding partner of LAN (Local Architecture Network) in Paris.